We’re excited to share that two quilt blocks were installed at the Inn on Mill Creek yesterday as part of the McDowell Quilt Trail. We have blocks #23 (Dave’s favorite/lucky number, coincidentally) and #24. 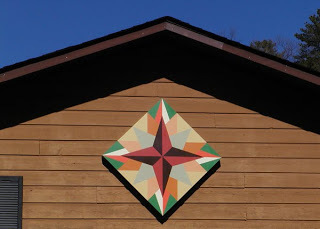 Our blocks are Morning Star, which we did in Fall colors and installed on the south end of the Lake House, and Evening Star, which we had done in Spring tones gracing the Pool Garden on the north end of the Lake House. 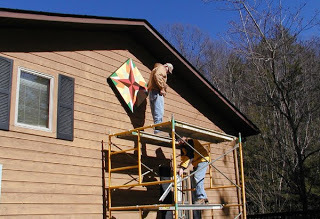 The McDowell Quilt Trail, a project of the McDowell Arts Council Association (MACA), currently has 25 blocks that highlight the historical significance of Appalachian arts and crafts in our part of Western North Carolina. 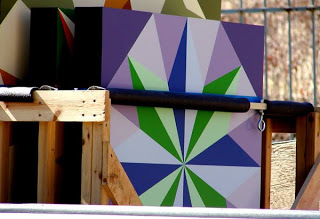 The blocks are featured on homes and businesses throughout McDowell County. 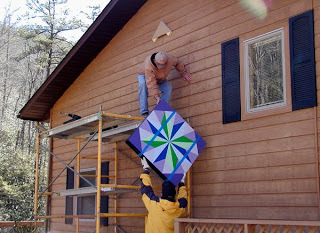 According to the McDowell Quilt Trail website, one of the primary goals of the quilt trail is to “honor the mountain heritage of quilt making,” and we think that’s pretty cool. Below are a few photos we took during the installation of our blocks on the McDowell Quilt Trail; more photos are available on our Facebook page. We hope you’ll consider being one of our fans on Facebook, where we’ll be posting lots of photos throughout the year, and if you get the chance, drive the McDowell Quilt Trail. This entry was posted in Uncategorized and tagged art, Facebook, Old Fort / Andrews Geyser by Inn on Mill Creek. Bookmark the permalink. Your Inn is fabulous! The quilt blocks just enhance the natural beauty you already have!